In today's busy world, very few people have the luxury of having a spare hour or more for a proper workout. You have your personal health and wellness goals to meet, but just don't have the time to exercise. Fortunately for you, my goal is to make you the best version of you possible -- the version of you that is healthy, fit, and looking good. The first step in meeting your health goals lies in taking a number of steps that go nowhere -- the treadmill. Now typically, most people lose weight by cutting calories. This works for a while, but before long they revert to their old eating habits, gaining back whatever weight they had lost. Let's make something absolutely clear: the treadmill is cardio training for people who hate cardio training. You do not have to spend a lot of time on the treadmill; you just have to be consistent with it in order to see results. In addition to burning calories, building muscle, and releasing endorphins, exercising regularly on the treadmill helps curb compulsive eating and food addictions, and lowers both blood pressure and cholesterol levels while increasing libido. Fifteen to 30 minutes on the treadmill, four to five days a week is all you need to reap the multitude of benefits that it offers. Fortunately, it also only takes four to five short sessions in one week to begin forming a habit. "Forming a habit," in this instance, means that when you skip a session, you find yourself missing the treadmill. Here's the thing though: you're busy. You don't have the time to make it to the treadmill four to five days a week, when you could be getting work done or relaxing. So, when you do manage to find the time to make it to the gym, you have to make it count. For those seeking to maximize the efficacy of their treadmill sessions without spending all day locked onto a human hamster wheel, look no further than high intensity interval training. igh intensity interval training, or HIIT, is part of the maintenance program that I recommend to my patients. HIIT compresses exercise into a short period of time. HIIT involves working really hard for a short burst of time, followed by a recovery period at a slower pace. This intense interval, followed by a rest interval, is then repeated. The HIIT workout plan has many advantages. For starters, the sessions are no longer than 15 to 30 minutes. It is an excellent fat burner which extends long after the workout session ends. This fat burning extends for up to 16 to 24 hours post-workout. That's right — you're burning fat even while you sleep! With HIIT, you're burning more calories than you would with a longer low intensity exercise in just a fraction of the time. Now I'll admit, suggesting something with "high-intensity" in its name to those who are already hesitant towards exercising seems counter-intuitive. HIIT sounds intense — likely because intensity is in its very name — but the hardest part is taking your first steps. Here's how you get started with HIIT. 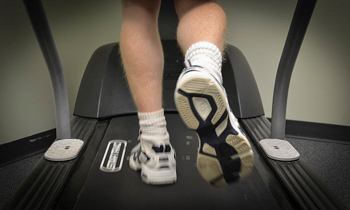 First, prep the treadmill by raising the incline anywhere from 25% to 100% elevation. Next, use your rate of breathing to find the correct pace during the intense part of the workout. Start walking on the treadmill, increasing the pace until you find yourself having to breathe through your mouth, not your nose, in order to get enough air. Your breathing will be labored but sustainable. If you are able to understand what someone is saying but you cannot comfortably talk, then you have found the HIIT ZONE. Keep in mind however that high intensity does not mean self-destructive; you should be breathing through your mouth during the intense interval, not running so hard that you're fighting back nausea. For your rest interval, your recovery time should be either half of or equal to the intensity phase of the workout -- keeping in mind that you never want to recover completely. For example, if you walk on the intense incline for 5 minutes, then your recovery phase should be no longer than 2 ½ to 5 minutes. In the recovery period flatten out the treadmill and slow down the pace, but do not come to a complete stop. Remember, you will lose the long term post workout burn if you allow yourself to totally recover, so just throttle down the pace and flatten out the incline. Remember that the high-intensity part of HIIT is relative. If you find yourself breathing hard through your mouth at just a slight incline and an objectively slow pace, then your intense interval is at a slight incline and a slow pace. Start off slow, and in just a few sessions your intense phase will intensify. You don't want to injure yourself or overdo it at first; start with just 15 minute HIIT sessions, comprised of intense and recovery intervals. As crazy as it sounds, the more you commit to HIIT, the longer and more strenuous your sessions will become. High intensity interval training should be used in combination with a proper diet and supplements to control your hunger in order to best meet your fitness, wellness, and appearance goals. That being said, when it comes to cardiovascular exercise, HIIT is the best way to go, as it maximizes your results in the shortest amount of time possible, provided you're willing to make the commitment. Additional information provided by Jamal Smith.